Nick Sherman recently tweeted a quote by Dan X Solo; “If you become a typographer, you’ll become a scholar. The two go hand in hand. It can’t be otherwise.” Do you echo Dan’s sentiment? 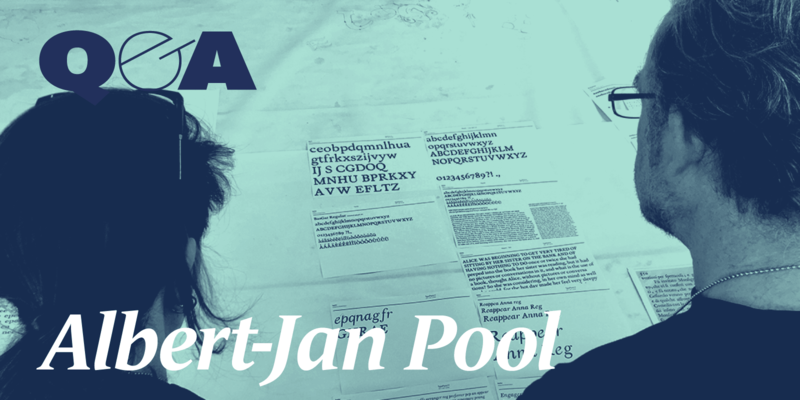 Albert-Jan Pool: In the first place, I think that we have to take in mind that Dan X Solo was a collector and admirer of typefaces and lettering rather than a scholar at an academic level. He was merely pointing at the fact that many of us somehow become aware of the rich history of type and dig into it the one way or another. I only partly echo the quote though. I think it can be otherwise too. Of course it can be very interesting, and in some cases even necessary to study the historical aspects of what we are doing. Theoretical analysis of type through printing types and their history like Updike did is one thing, but gaining practical experience is as important, I think. Writing with broad and pointed nibs and brushes is fundamental to type. Experiencing the difference between an interrupted (roman) and a running (cursive) construction in several hands enables us to work with the essentials of type by ourselves. Writing letterforms with the tools through which they were created makes it is easer to comprehend them than by just looking at the letters or by copying them through drawing. When you want to fully understand our letterforms, it will prove to be invaluable when you are able to create such letterforms yourself, rather than describing or imitating them. Theoretical analysis of type through printing types and their history . . . is one thing, but gaining practical experience is as important, I think. When it comes to typography, i.e. the use of type, it depends on the kind of work you are doing, I think. You can design a great ad campaign or a logotype when you rely on your intuition only. To make sure that what you do is not only genius and prize-winning but also serves the customers needs best and also pays off in the long run, you will have to research, analyse, reason and reflect your work. Information design like scientific literature, websites with complex structures, dictionaries and schoolbooks is also dependent on the attitude of the typographer involved. Such designs are likely to become more legible, readable and functional when the typographer involved does not only make sure that everything has a nice look and feel, but also studies and analyses the content and designs the typographic accordingly. You seem to have devoted a lot of your time not only to drawing type, but research and academic study. Do you feel your work is richer because of this? Yes, in my case it is, but again, it is not the only or the best way. Many typeface designers are practical people. They would rather learn by doing, than by thinking about what they’re creating. Typeface designers are not that different from the average typographer or graphic designer as some like to think. What stands out as instrumental in your education and growth as a type designer? This could be a person, school, or any other resources. To me it was definitely Gerrit Noordzij in the first place. For Gerrit, writing definitely is the key to typeface design and also to typography, so as a student I took it for granted. Later, when working at Scangraphic and URW I realized that there are many other ways to design beautiful and interesting typefaces. Still, I believe that I would not have become that good a designer without the insights gained through writing. Even when designing FF DIN, I relied on that knowledge. What do you love about your field of work? As a typographer and especially as a typeface designer we get to know a lot of things about our trade which is merely a footnote in the universe of design. On the other hand, we get to know a little bit of everything else. I learned about a lot of interesting things through conversations with my customers. What I also like is that there will always be new challenges and new demands for type. But you’ll have to look for them, talk with your potential customers, with those people who are really involved in the projects you are working on. It can be surprising how clear some people can tell about their expectations towards typography and typefaces. Of course we can not solve all their problems through type and typography, but I believe there are always some problems that can be solved when we try to understand the worlds our customers live in. … I believe that I would not have become that good a designer without the insights gained through writing. Even when designing FF DIN, I relied on that knowledge. Are there are any negative traits or attitudes within the industry that you would like to see change? Yes. Monotype dominating both the retail and the corporate market is a thing that should definitely change. I doubt that their subscription system and the so called flash sales will bring any noticeable revenue to the designers. Google should pay much more to the type designers and should also let them financially participate in their success. It is not fair that they make billions and designers are left with the crumbs. The industry as a whole should invest in original work rather than in déjà vu designs. Furthermore I agree with Fred Smeijers, who stated that the biggest enemies of typeface designers are other designers who would rather imitate their colleagues than strain their brains in order to create something new. In the first place, I am highly inspired by the questions of my students. They often make me re-think what I teach them and how I do it. When it comes to art, I think that I am inspired by constructivism, futurism, cubism, modernism and concrete art. Furthermore it is the pedagogic ideals of people like Froebel and Montessori and the visions of architects like Berlage, Herman Hertzberger, Otto Niemeyer and le Corbusier. One thing that really fascinates me is socialist modernist architecture. Many of these buildings are now in very bad condition because the countries cannot afford to maintain them anymore. Either got stuck in their totalitarian past and or they are ruled by mindless people advocating neoliberalism, it is sad to see the decay of that cultural heritage. Could you share one of your funniest or most embarrassing quirks/stories? It think it is embarrassing that FontShop and FontShop International first profiled as a home for independent typeface designers and foundries and then left them with a company which the opposite of these ideals. It does not make sense to keep complaining about that though. We should rather look at how we can learn from this. Read contracts before you sign them and stop playing the artist when it comes to money. Everything is subject to change, don’t put all your efforts on one card, take care to have a plan B.